For mid- 2018 and beyond, the IPC4K11 comes with a high end Starvis image sensor for enhanced low light sensitivity and a plethora of Smart Detection features that provide video analytics usable on the camera itself or with one of our compatible NVR recorders. This all new Ultra HD 4K Security Camera offers unparalleled features and video resolution that allows for video recordings that can be zoomed in to while maintaining clarity. These cameras are built with a top of the line 8 Megapixel CMOS image sensor supporting that allows the camera to record at 4K resolution (3840 x 2160 pixels). All this is packed into a very light, solid and easy to mount bullet style camera. This camera comes standard with a 4mm lens that provides a 87 degree angle of view. Being 4K resolution, the actual image size is huge, meaning you can digitally zoom in to see all the details and clarity. You can recognize a face up to 66ft away with our 8MP 4K cameras such as this 4K bullet camera. You can use digital zoom on the camera or the NVR to magnify video of interest during live view or playback as shown in our video here. The camera also has up to 130ft of IR night vision, and True WDR for glare reduction. This 4K security camera is perfect for uses indoor and out in almost any scenario. This camera is absolutely top of the line with a resolution unseen before in security camera technology. If you want the absolute best resolution available for security cameras, we suggest you get one of these. Powering the camera is easy. You can use either our PoE Switches, or a 12V DC power adaptor. 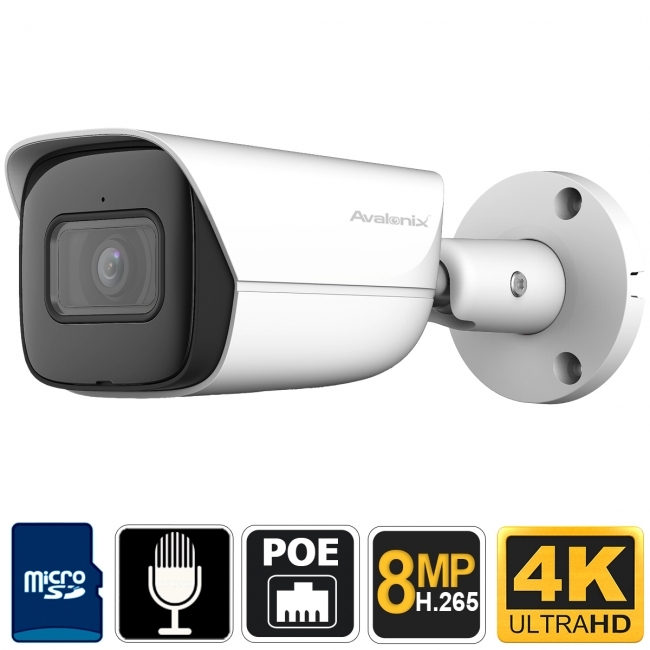 This camera also has extended PoE technology that is compatible with select NVRs we carry that have extendedPoE techonology to allow PoE distances up to 1600ft. 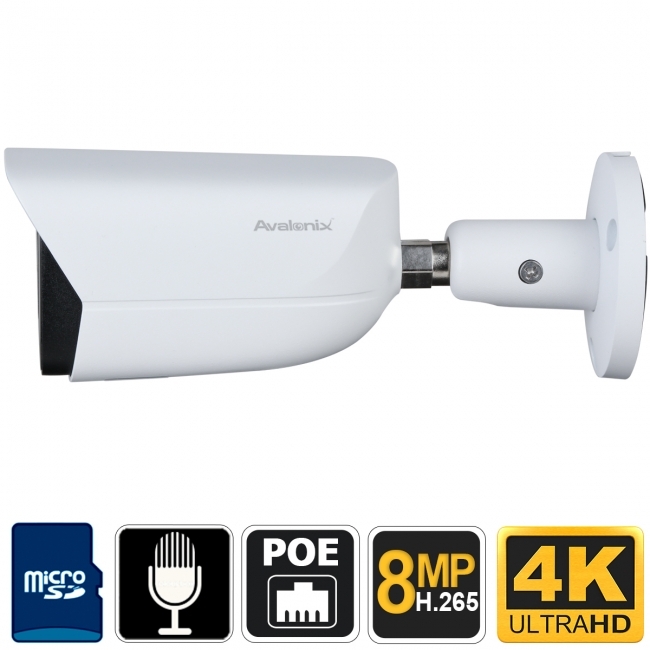 Since this is a IP camera, it can be streamed directly to your computer using our PC/Mac viewing client or Chrome, NVR, mobile phone, or tablet device. We include our free Windows/Mac software suite to view video, or you can use any third-party video recording suite that accepts ONVIF compatible IP cameras. For best compatibility and ease of use we recommend using one of our 4K NVRs which also support H.265 for bandwidth savings. When using for residential home security application, what other hardware would I need to purchase? DVR? Software? Could I view instant stream over phone? With every camera you would need a recorder to save the video. For this 4k security camera you would need a compatible 4K nvr recorder that supports 4k resolution recording. To see how our security camera systems can be viewed remotely, please check our section titled Remote Viewing Security Cameras for tutorials and examples. Can this camera stream 2k and or 4k in real time to a PC over IP? The 4K IP Camera Bullet supports up to 15fps at 4K resolution. Real Time means video that is 30fps. It cannot support 4K at 30fps. If you stream video at 2K we find the video to be a little blurry because of the down sampling. For uses such as the one you described, we suggest the 12MP 4K Ultra HD Bullet Camera which support Real Time Video 30fps at 4K and 2K. Are these cameras compatible with Zone Minder? Zone Minder supports using ONVIF cameras over the RTSP protocol which our ip based security cameras offer. It will allow you to tap in to the video stream from our ip cameras, including 4k security cameras like this camera. Can we use this for web_cam purpose/ live streaming ? Yes you can use the RTSO stream and use a service like Ustream to embed it in to your webpage. Do you have any 4K outdoor IP cameras with built-in Mikes for getting audio? Dont need a speaker, but want to hear what is going on. How many max resolution images can be captured on the 4K IP Camera bullet before the memory card is full? A still 4K image taken with this 8mp camera is about 8MB. You can take snapshots at 6 hour intervals, so there will be a total of 4 snaps per day, which equates to 32MB per day. A 128gb SD card has 119,000MB usable space. You can take 119000MB divided by 32MB, which is equal to 3718 days worth of snapshots. 1. Is possible to turn off the IR leds? 2. Is it possible to grab a image(jpeg) via a url ? 3. Is there a management website on the camera or a separate software is needed? 1. Yes you can turn off IR LEDs on this camera by lowering their intensity under manual control. 3. The camera has a built-in web server that you can log in to, please see the video on our post about how to connect your IP camera to your computer. I have the LTN8708-P8 which can record to 6 mp. I am looking at your 4K IP Camera Bullet (IPC4k11) 8 mp. Wondering if down sampling will ruin any recordings. Any other recommendations? Down sampling this camera will not ruin the recordings. You will have to log in to the camera's web interface and decrease the resolution being output over the main stream. The NVR you mentioned will be able to capture the video stream using the ONVIF driver, but may not capture motion events. Is there some sort of silicone skin to make it match my house color? Sorry they come only in white and there is no silicone skin. What functions are available in connection with the advanced analytics features? How do the features work? Can the face detection be programmed with individual faces, or does it trigger upon the detection of any face? You can learn more about smart detection video analytics here and you can find more cameras with Smart Detection Cameras here. Please note face detection is not facial recognition. It is the ability for a camera to distinguish a body as a person instead of an animal. It is used in certain close up scenarios where the face is no more than 3 ft from the camera.